I noticed several saltwater hermit crabs piled up at the front fighting for food, as I watched my saltwater aquarium after feeding time. Their antennae raised and lowered in a warning communication call. It was fascinating to watch them duck and dive for the food pieces, maintaining their distance from each other yet still attempting to steal the morsels. Hey, That’s Mine!! Get your Own! 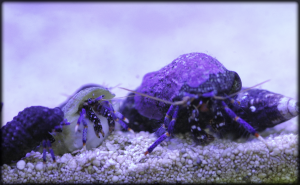 One of the best uses for Saltwater Blue Leg Hermit Crabs is the reduction of Cyano Bacteria aka Blue Green Algae aka Red Slime Algae. I conducted an experiment with a patch of slime algae and 100 Blue Leg Hermit Crabs. The pictures speak for themselves! The diversity of saltwater hermit crabs is amazing, from blue legs, green legs, brown, red, scarlet, white and black. Additionally there are many that have some type of patterned design; ie: halloween, blue knuckle, etc. Some grow very large while other stay small. The diets are very different as well, from carnivores to strict herbivores. Blue Leg Hermits typically will utilize a shell from a whelk, turbo or cerith. I have seen some pretty inventive hermits who took up house in pieces of sponge, dragging it around on their back.